ï»¿ Keighley and District Model Engineering Society. Minature steam trains, model yatchs and model boats. Our boats. 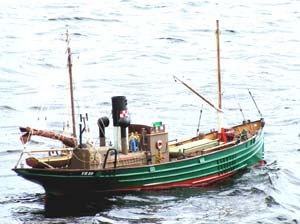 Scratch built she is loosely based on a steam drifter in use as a pilot vessel. She is about 24th scale and comes out at about 48in. long. 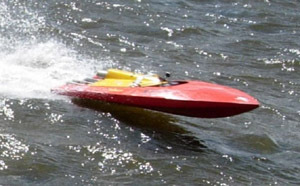 The power boats have very sleek lines and will lift above the water like the real thing when at speed. 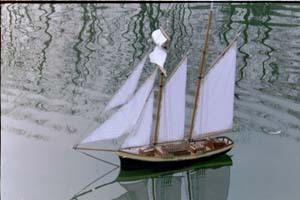 This scratch built topsail schooner is plank on frame construction from a Nexus Plans service drawing. She has an auxiliary electric motor to help cope with the depicted conditions. 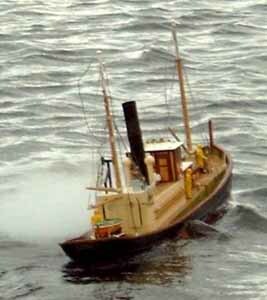 This is an 1/18th scale model of 'Lydia Eva' the last steam drifter. 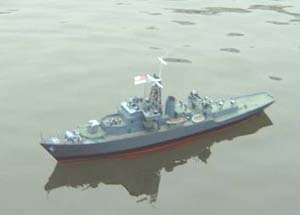 Built from measurements and photographs taken on board the real thing in dock at Lowestoft by Bob & John. She is steam powered and is scratch built. The crew are adapted from garden railway figures. She is big at some 67ins long and in sailing trim weighs about 70 lbs. definitely a two handed job to launch. This Castle Class frigate is scratch built to a scale of 3/16 ins to the foot from a 'Norman Ough' plan. 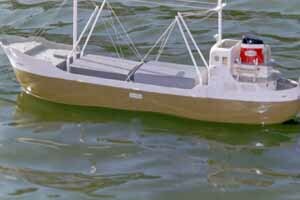 She has a fibreglass hull and is electrically powered. This page was last updated on Sunday 23rd March 2014 at 19:00.